Doing good. Got a new car (after the old van died in our driveway after critique group). End of the school year is pressing into us from every direction. My to-do list has thirty-some things on it, not including writing. So of course writing comes first. At least I’m successfully ignoring the siren song of tumblr. I also read My Girlfriend Bites, by Doug Solter, which has been chilling on my kindle FOREVER. 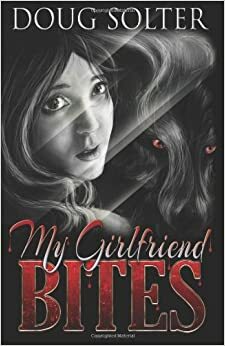 My Girlfriend Bites puts a new twist on the paranormal young adult theme. Instead of the male character being the vamprire/werewolf/zombie/whatever, it’s the girl who is the werewolf. The story starts out being told from the guy’s point of view, which is a refreshing change from the books I normally read. Later, it transitions to the girl’s viewpoint. It was fun to get in her head, both in her human form and as a wolf. Book description, from Amazon: After his “dream” girl rejects him, 16-year-old Aiden tries to commit suicide, yet mysteriously survives. Now the teen feels like a loser with zero possibility of finding a girl. Then during a rainstorm, the creepy teen girl at school with too much hair offers him a ride home. Bree Mayflower’s act of kindness surprises Aiden as the two teens feel an attraction to each other that sparks a romance. Bree soon reveals her deep, dark secret to Aiden. Her family are werewolves hiding from the Demon Skins, a mysterious new enemy killing all the werewolf packs on earth. Aiden struggles with his girlfriend being a shifter while Bree struggles with helping her boyfriend whose lack of self-worth and cowardice puzzles a girl werewolf. Can she rely on him if the Demon Skins ever discovered her family? Will Aiden be there when she needs him? It would be so easy to just turn him into a fearless werewolf. But that bite thing is only a myth. All Bree can do is hope that the boy she loves will be strong enough to believe in himself when the time comes. This was a fun read and passed by quickly. It was quite a bit different from Doug’s other YA novel, Skid, but I enjoyed both of them. I don’t read a lot of indie authors – since you generally have to order them sight unseen, it’s a gamble to spend money on these books. I’ve gotten a few that didn’t have a real grip on grammar, or that didn’t have fully developed characters. But Doug’s books are worth reading. Doug’s from the Tulsa area, so we’ve seen each other at a couple of statewide conferences and we’re online friends. Because of that, I know that he’s currently working on a sequel for Skid, which I’m looking forward to. I also notice that on Amazon, My Girlfriend Bites has Volume 1 after the title. I don’t remember that being there before, but it’s good news to me. It’s always a pleasure to spend more time with characters you’ve enjoyed. This entry was posted in Book Reviews, Oklahoma authors, SCBWI by Regina Garvie. Bookmark the permalink.